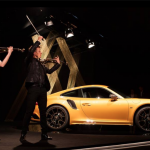 Highclere castle was the venue for a stunning reveal of the new Porsche 911 model. We produced a series of 4m high gold shards from laser cut steel plates and woven bungee. These were illuminated during the reveal creating a sparkling backdrop for the centre of attention.